Chemicals are everywhere. When it comes to chemicals, there are certain places they should be—inside our gas tanks, for instance. But when chemicals get where they weren’t designed to be, there can be some harmful side effects. For example, the chemical compound that powers your car is perfectly fine in a plastic container. However, it can do some real damage to your lungs if its inhaled. Below are a few of our favorite air purifier designed to capture chemicals. While most of these have similar features, the price / size / design of each one will determine which one is best for your needs. Alen designed the BreatheSmart to provide the cleanest air at the lowest decibel level possible. It is suitable for rooms around 1,300 square feet. Plus it provides an ozone-free ionizer to trap as many small particles as possible. 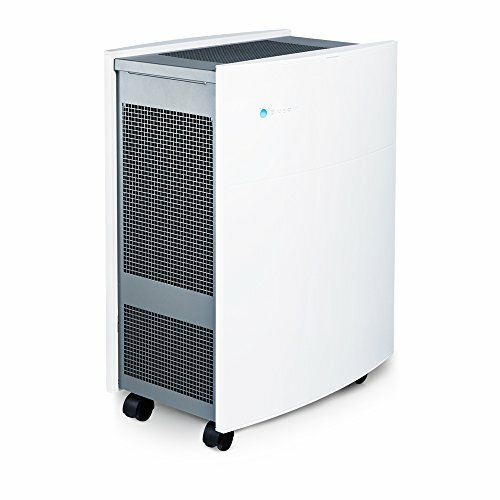 The Blueair 605 is one of the company’s largest purifiers. But it is also one of the most popular on the market. 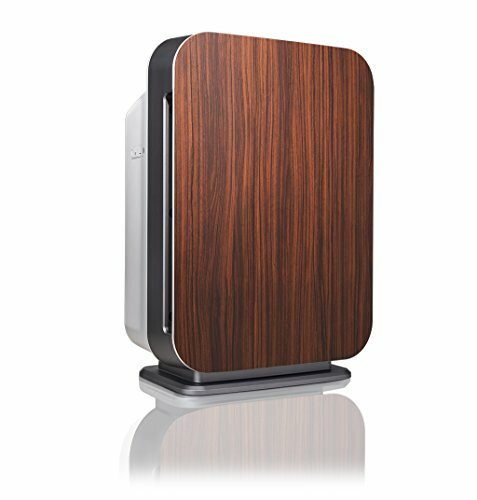 It offers “HEPASilent™” technology to provide clean air without noise. The HEPASilent filter itself has activated carbon in it, so the filter itself absorbs odors and harmful chemicals in the air. 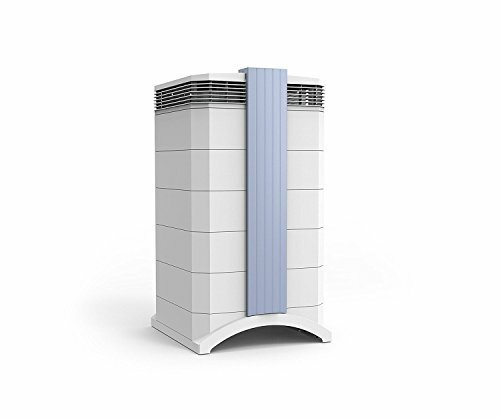 Make sure to check out the more detailed BlueAir 603 air purifier review here. What is so bad about Chemicals? Nothing, really. At least, there aren’t many chemicals that are “bad”. Take sodium, for example: on its own, sodium is one of the most volatile elements on the periodic chart. (Sodium will explode on contact with water!) But if you mix it with Chlorine, another very dangerous chemical, it becomes Sodium Chloride (NaCl)—ordinary table salt. On the other hand, Chlorine on its own is an incredibly corrosive gas and the main ingredient in household bleach. And when you inhale Chlorine gas, it immediately starts to damage the sensitive lining of your airways. When certain gases are inhaled into our lungs and throat, they cause irritation that can cause reactions in our body. Sometimes it’s just a cough, or maybe a runny nose, but for those with sensitive respiratory systems, those reactions can be severe and maybe even life-threatening. People who suffer from asthma or chronic bronchitis can have an attack where their bronchial tubes swell and fill with mucus. This reaction is actually a normal defense mechanism used by the human body to protect our lungs from harmful pollutants in the air, but for those with sensitivities, this sort of a reaction is exaggerated until medicine is needed to reverse it. Even mild pollutants can set off these sorts of serious reactions, like smoke or sometimes dust particles. Of course, the best thing for us to breathe is just regular oxygen, mixed with a touch of nitrogen and a little bit of carbon dioxide. Unfortunately for us, however, we don’t live in a perfect world, and most of us live in an area that has at least one source of air pollution. Cars, factories, power plants, even large farms, produce an abundance of chemicals that are released into the air and wind up in our home. For people in urban areas, those chemicals are increased exponentially simply by our close proximity to each other. Whether you live in a sprawling city or are just concerned for your health, the best medicine is prevention. The first thing you should do is find a way that is suitable for you to clean the air in your home, before harmful chemicals in the air cause a chronic issue. While there are many ways to clean your air, from specialized filters for your HVAC unit, to plants that absorb extra compounds in the air, the absolute best appliance is an air purifier. The Clean Air Delivery Rate, or CADR, is the standard by which air purifiers are measured by the Association of Home Appliance Manufacturers, or AHAM. AHAM is an independent verifying body that different brands buy into, and for a fee, they will measure the amount of pollution that is removed from a particular room in a specific amount of time. The numbers measure Cubic Feet per Minute (CFM/CPM), or the amount of air that can be cleaned each minute that the air purifier is on. There are many different types of filters on the market, but when you’re looking for one for removing chemicals from your home, there are a few you should look for. Along with a filter to trap small particles, a good air purifier will come with a carbon filter. Carbon is a natural mineral that absorbs smoke, harsh fumes, household odors, and, yes, chemicals in the air. Many times the carbon in a filter will be called “activated carbon”, which means that the carbon used in that filter was treated with heat in order to remove impurities, giving you a more pure, more efficient odor absorber. Many times, the carbon will be mixed with another mineral, such as zeolite or potassium iodide, in order to better neutralize odors and increase the filter’s capacity to absorb chemicals. Many air purifiers you look for will advertise a HEPA filter, and while it’s not helpful for removing odors or chemicals from the air, a HEPA filter is still an important component of any decent air purifier. HEPA stands for High-Efficiency Particulate Arrestor, and it is a technologically advanced filter that is able to capture pollutants in the air as small as 0.3 microns in size. What this means is that a HEPA filter can clean your air of 99.97% of particulates, which is good for anyone with allergies or respiratory problems. Be careful, though! When looking for a HEPA filter, make sure it is advertised as “medical-grade” or “True HEPA”. Many companies want to cash in on the HEPA trend without putting the more expensive True HEPA filter in their units, so they will replace it with a subpar air filter and the name “HEPA-type” or “HEPA-grade” to confound their customers. An air ionizer is a small generator that produces negative ions in order to attract small airborne particles in an effect similar to static electricity. Like the HEPA filter, an air ionizer is not necessary to clean the air of harsh fumes or chemicals, but it is good at cleaning bacteria out of the air. In fact, in an experiment led by the National Health Service, air ionizers reduced the rate of Acinetobacter infections to zero. Many brands will advertise their air purifiers as “air cleaners”, and they will advertise their appliances’ ability to generate “activated oxygen”, “super oxygen”, “energized oxygen”, or “mountain-fresh air”. All of these terms are code for “ozone”, and ozone in your home is bad news. Advertisers will promise that their ozone generators, corona generators, oxygenators, and air cleaners neutralize bacteria and chemicals in the home while putting off harmless water and oxygen, but these statements are not true. Ozone is a volatile and dangerous gas that is a serious lung irritant and harmful for people with chemical sensitivities. The Environmental Protection Agency recommends that people avoid exposure to more than 0.08 parts-per-million over an eight-hour day. Which is why modern buildings use HEPA filters rather than ozone generators. So be sure when you’re shopping for air purifiers, AVOID OZONE. Overall, the best air purifier for chemicals on this list is the IQAir GC MultiGas. It is a bit more expensive than the others. But IQAir designed this air purifier specifically for chemicals. Remember, an air purifier is a good choice for anyone who needs an efficient way to clean the air in their home, and whatever your needs, there is one on the market that’s good for you! An air purifier is a special appliance that removes pollutants from your home by forcing the air in a specific room or rooms through a series of filters, which are designed to trap and neutralize chemicals and allergens. Most air purifiers are equipped with multiple filters and various features to provide consumers with the cleanest air possible. But with all the different features and names and numbers, the choice can feel overwhelming. Fortunately, there are only a few things on every air purifier that you should look for.